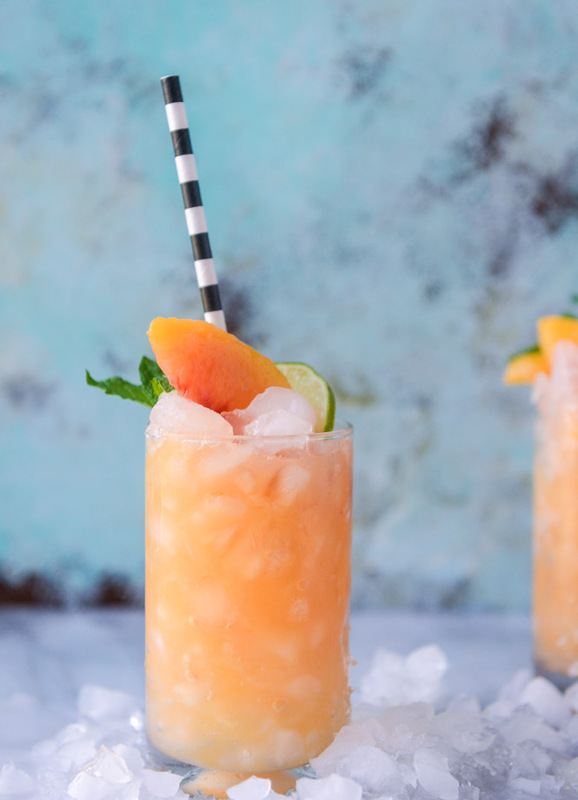 This agua fresca is SO incredibly refreshing. It’s not super sweet and if you’re a fruit lover, it hits the spot. I even find it to be more thirst-quenching than lemonade because it’s just so light and lacks any tartness or sugary aftertaste. It’s the best thing ever on a hot summer day. At least the best thing ever right now, because next week you know I’m going to tell you about the next best thing ever. note: to make the simple syrup, combine equal parts sugar and water (such as 1/4 cup each) in a saucepan over medium heat. whisk until the sugar dissolves and simmer for a minute or two, then remove from the heat and let cool completely. Add the peaches, pineapple and 1 cup of water to a blender and blend until completely pureed. Using a fine mesh sieve, pour puree through into a large bowl or measuring cup, using a spoon to press the last of the liquid out when you get to the end. Combine the juice with the remaining water, lime juice and simple syrup in a large pitcher. Taste and add more syrup if desired. Chill until cold. Before serving, add the frozen peach slices (to act as your ice cubes!) along with a few ice cubes if you’d like it super cold.